We’ve been there. We’ve lost parts, had them stolen, misplaced them so that we had to rent or order more. We’ve had heavy equipment break down mid-operation due to infrequent maintenance and lost time on the project schedule to accommodate repairs. We’ve sacrificed margin on our jobs after blowing our small tools budget. We feel your frustrations, and we agree the time is now to get this under control. But where to begin? What is RFID, and how can it help me monitor my inventory? How does fleet tracking work differently than small tool tracking? 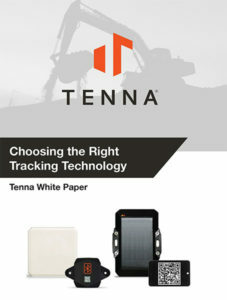 What equipment is better suited with a GPS tracker versus a Bluetooth tracker? What is LoRaWAN, and do I have jobsites that would benefit from this? So many asset tracking options are presently on the market and if you are not necessarily technologically-savvy, you might be intimidated by these varieties. Likewise, you may simply lack the time to do a deep dive into researching these technologies, how they work, and how they would be useful to you. To simplify this process, we’ve prepared a guide to asset tracking technologies to help compare available options in one place. We cover short definitions on technologies and how they work – including QR, RFID, Bluetooth, Cellular GPS and LoRaWAN – as well as what technology is the best fit for tracking different types of asset classes. This quick guide is designed to answer some of your questions, ease some of your apprehensions and help you match the right technologies to the assets you have so you can take a step forward towards an asset management solution that works for your business. Asset management tools have a high ROI by nature and offer peace of mind through increased visibility and efficiency. We hope you find this resource valuable.